Children and adults are fascinated with dolphins. Dolphins are one of the most intelligent creatures on Earth. Preschoolers will love these fun dolphin activities. Show your students pictures or video clips about dolphins. Explain that dolphins live in the ocean but they are not fish, instead they are mammals and can only stay under the water for 15 minutes. They breathe through a blowhole on the top of their head. They have one baby called a (calf) every year. The dolphin’s brain is similar to ours. They love sardines, fish, and shrimp. Have children brainstorm other mammals that are warm-blooded and feed their young milk. Discuss other mammals that live in the ocean. Explain to children that echolocation is a sensory sonar system using sound waves that dolphins use to find food or warn them of dangers in the ocean. Ask questions such as, "Have you ever heard your echo? How do we hear? How does sound travel?" Explain that sound is caused by vibrations. Bottlenose dolphins are very smart and a large part of its brain is used for communication or "echolocation". Dolphins send out vibrations by making a clicking sound, the sounds bounces off objects and the returning sound waves are picked up by the dolphin's forehead and lower jaw to help the dolphin determine how far away something is and how big it is. 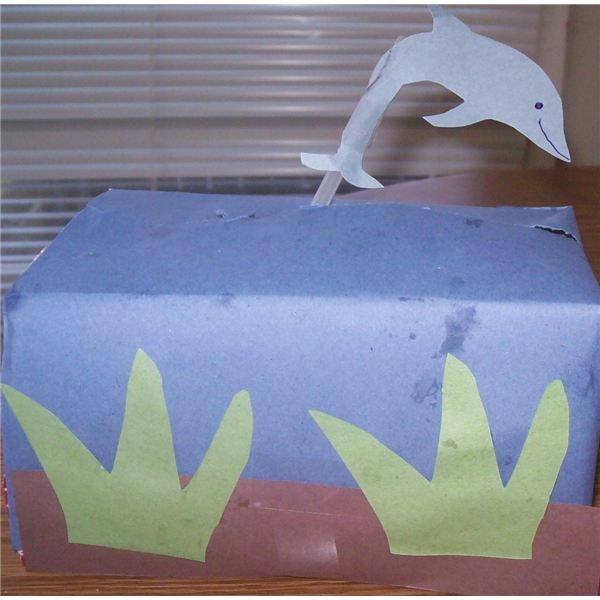 This is a fun dolphin activity for preschoolers to help reinforce the lesson. Explain to students that they will be playing a classroom game that will show how echolocation works. Choose one student to be the “dolphin." Seat that student in the center of the room and blindfold them. Other students will be the “fish" swimming clockwise around the edge of the classroom. When the teacher says, “STOP," all “fish" go to the corner of the room closest to them. The “dolphin" claps twice to represent sending an echo. “Fish" clap twice to represent echo returning to the “dolphin." The “dolphin" points to corner of the room where he or she thinks the most fish are. All “fish" in the selected corner are “captured" by the dolphin and sit near the “dolphin." Teacher says “swim" and game continues. The last “fish" not captured becomes the next “dolphin." The teacher will demonstrate how to make a sound like a dolphin. The teacher will create some of the same sounds that dolphins make with a balloon. Squeeze and stretch the neck of the balloon and let the air out slowly. Small children should never play with balloons that are not blown up. Children will love using the computer to learn about dolphins, watch video clips and play games. For a fun game called Under The Sea Adventures children will catch fish and rings on their nose. 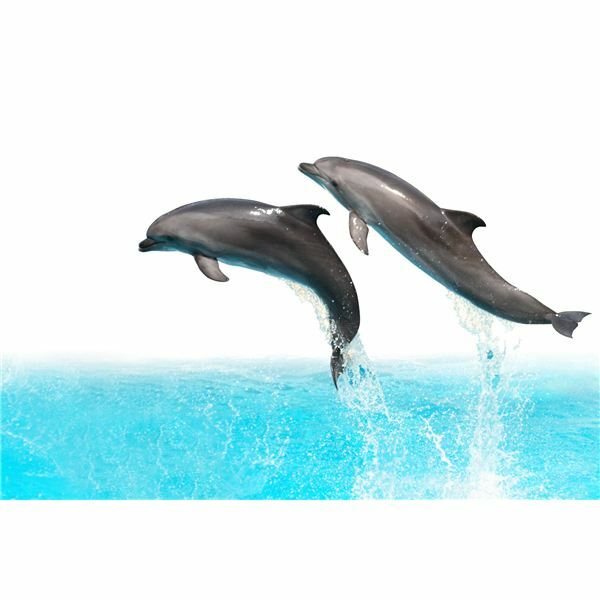 To reinforce what dolphins eat and practice counting skills play the Super Duper Dolphin online game at Nick Jr. For printable coloring pages, fun facts and everything you ever wanted to know about dolphins visit Dolphins at Dolphin Kinds. Explain that dolphins live in the ocean. Children will love this fun dolphin science activity for preschoolers. Fill the bottle mostly full with water. Next add about a 1/4-cup of white vinegar and 1 Teaspoon of baking soda to the bottle. Drop a small handful of raisins into the bottle. And then watch. The raisins will collect bubbles all around them from the vinegar and baking soda chemical reaction that will cause them to float to the top. Once the reaction calms back down they will sink back down and then form more bubbles (causing them to rise again!) This will repeat for up to a half-hour. Cut the top off of the milk carton so that you are left with a rectangular box. Lay the box on its long side. Cut a slit along the top of the box and the bottom of the box (this is where you will put the popsicle stick when the craft is complete). Wrap the entire box with blue construction paper. The easiest way we found to do this was to cut a piece of construction paper large enough to wrap around both ends (wrap as you would wrap a present). Then wrap a full piece of paper around the whole box that covers the wrap jobs at the ends. Use scissors to cut through the construction paper over each of the slits. Cut a strip of brown construction paper that is slightly wavy to use as the bottom of the ocean. Glue into place on the box. Cut green construction paper into some water plants and glue onto the ocean bottom. Color the Popsicle stick blue. Print out a dolphin template sheet. Cut the dolphin out and glue to the Popsicle stick. Put the Popsicle stick into the slit in the box. If your Popsicle stick is too short to effectively move the dolphin around, tape two sticks together to get the extra height.